Your child’s school occupational therapist will structure therapy goals around educational goals, while your clinic occupational therapist will structure therapy goals around your child’s physical goals. While both school-based and clinic-based occupational therapy can benefit your child, they each have their pros and cons. 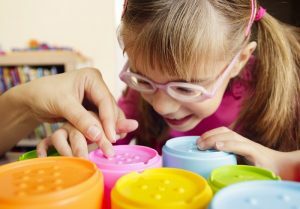 Here is a rundown on what exactly occupational therapy is and the real differences between school-based and clinic-based occupational therapy. Occupational therapy is essentially when a specially-trained therapist teaches someone of any age how to do the things that they need and want to do through everyday activities. Occupational therapy aims to help your child acclimate to a wide variety of environments from home, to school, to work, and to the community at large. Many people confuse occupational therapy with vocational training or job training, but they are two different things. So, How Are School-Based and Clinic-Based Occupational Therapy Different? Both types of occupational therapy use different models as their basis. School-based occupational therapy typically uses an educational model that is aimed at education and academic performance. The school-based model follows the Individuals with Disabilities Education Act or IDEA. School-based occupational therapy typically begins with a student being identified by their teacher or parent and requesting an IEP. The IEP team will determine whether or not the child should be tested, what areas should be tested, and how to proceed. Clinic-based occupational therapy follows a medical model that begins with a diagnosis and a doctor’s referral. Clinic-based occupational therapy is also typically covered by insurance. They will create a plan full of interventions to address the areas that the child has difficulty in and reach in and out of the classroom. The goal of clinic-based occupational therapy is to have your child functioning well in all environments. This entry was posted on Friday, January 27th, 2017	at 10:07 am	. You can follow any responses to this entry through the RSS 2.0 feed. Both comments and pings are currently closed.